Mr. Muhammad Humayun Kabir, Secretary, Ministry of Health and Family Welfare visited YPSA-GFATM912 program (Providing Primary Prevention of HIV and Risk Reduction through Workplace Intervention in Garments Factories/Industries) at Chittagong on 6 November. He exchanged views with the trainees in a Life Skill Education Session on HIV for the garments workers organized at the YB Garments of ASIA Group, Chittagong. Dr. Abu Tayab, Civil surgeon, Dr. Ali Amzad, Deputy Director of Save the Children (USA), Mr. Dipu Nath Biswash and Mr. Sheikh Mahbub Ahmed from YB Garments of Asia Group, Md Arifur Rahman, Chief Executive, YPSA ware present among others. 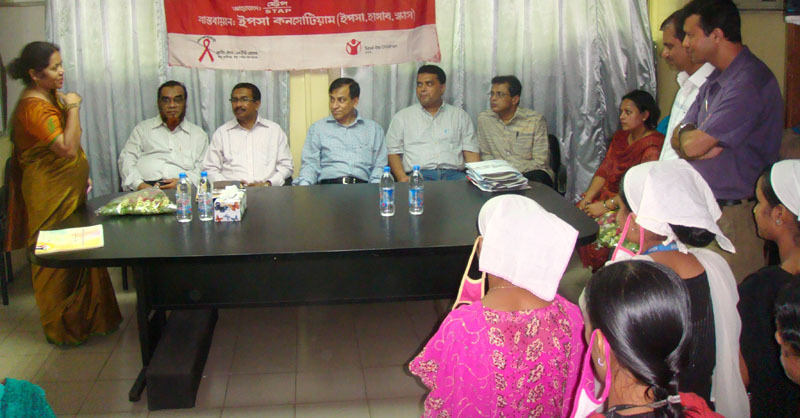 The Secretary expressed his profound satisfaction over the activities on HIV prevention in Chittagong.